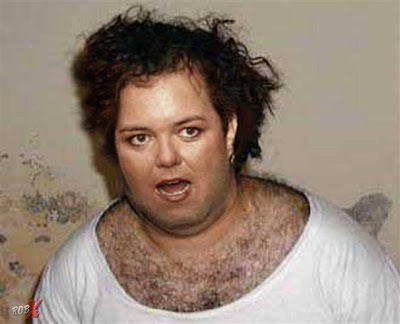 WAKADO: "Monster Pig" Shot And Killed By 11 Year Old Boy Looks Remarkably Like Rosie O'Donnell / 1,051 Pound "Monster Hog" Killed By 11 Year Old Boy In Ala.
"Monster Pig" Shot And Killed By 11 Year Old Boy Looks Remarkably Like Rosie O'Donnell / 1,051 Pound "Monster Hog" Killed By 11 Year Old Boy In Ala.
BIRMINGHAM, Ala. — State wildlife officials said Wednesday they want to know how the huge hog dubbed "Monster Pig" got into a fenced hunting preserve where it was chased down and shot to death by an 11-year-old boy. The young hunter is not accused of doing anything illegal, but the head enforcement officer for Alabama's wildlife agency said agents are trying to determine if anyone broke a state law prohibiting the transportation and release of live feral swine. "There are some questions about where the animal came from, how he got there, how long he'd been there," said Allan Andress, enforcement chief for the Alabama Wildlife and Freshwater Fisheries Division. MONTGOMERY, Ala. (AP) - Hogzilla is being made into a horror movie. But the sequel may be even bigger: Meet Monster Pig. An 11-year-old boy used a pistol to kill a wild hog his father says weighed a staggering 1,051 pounds and measured 9 feet 4, from the tip of its snout to the base of its tail. Think hams as big as car tires. 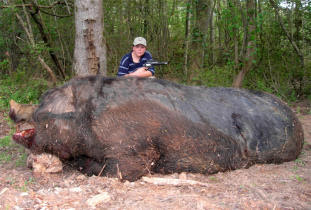 If the claims are accurate, Jamison Stone's trophy boar would be bigger than Hogzilla, the famed wild hog that grew to seemingly mythical proportions after being killed in south Georgia in 2004.